I killed a rabbit today and figured I would share with you guys how I cooked it primitively in the forest with just a knife! 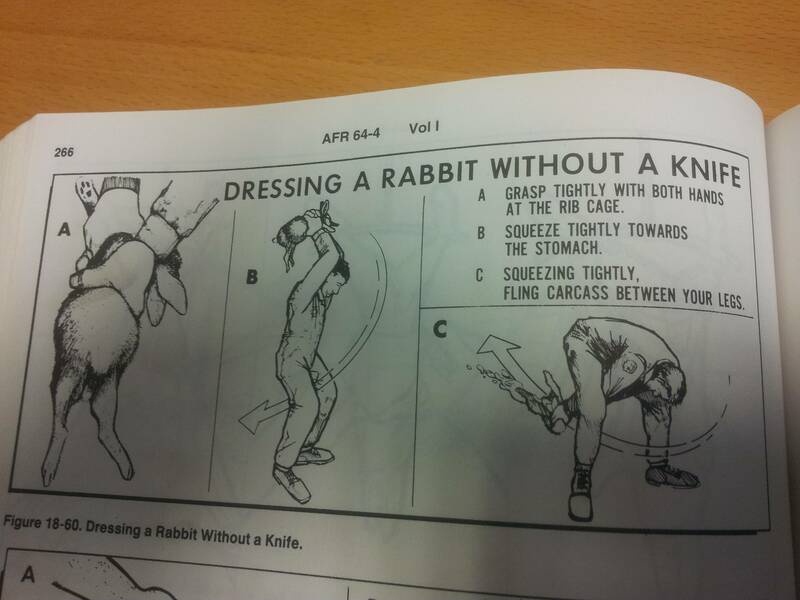 First you must skin and quarter the rabbit. Start a fire and add fuel to cook your rabbit over. Cut down three small saplings. Two must come to a fork and be sharpened at the end and shoved into the ground. The next one is smaller and smooth and sharpened at one or both ends. Stick the small sapling through the piece of meat. Put it over the fire until it appears cooked. Next step is to chow down! awesome outback feast,show some more if you get a chance. Ok for people like me: the city folk, what do you eat?? Hey Jake Found this thought you might like to know about it, just in case you didn't already know about it, WARNING, WARNING, WARNING, Danger ahead will robinson. These links may be unsettling for some and are definitely "NSFW". Do not look if you are weak of stomach. Poor rabbit. Unless it's 100% real raw survival, I can't see how anyone would have the heart to kill a fluffy little bunny, probably only out for a little sniff and hop. I know you call it fluffy little bunny but you have to remember they are considered food meat in many, many places. In fact in Australia they are a nuisance. There were a few breeding pairs released on a island off the coast and then they got got on to the mainland. Now they are eating all the food that other species use for themselves and are now driving some species to extinction. So eating an invasive species is completely justified as opposed to mass slaughter and poisoning which are then left to rot for no good reason. If I remember correctly there are even some industries opening up that process the meat and sell it like any other food meat product. Also it is very lean and healthy, in fact in survival situations you can lose too much needed fat if you eat it for too long and die. As for the REAL RAW survival after 3 days of no real food that would be the best meal you had eaten in a while. Remember "hunger is the best spice". As opposed to a chicken, pig, or cow? First you must soon and quarter a rabbit, huh? Kind of mailing it on there, hey Elmer Rudd?